UNION GROVE, Wis.-Fresh air, pasteurized milk and plenty of clean bedding….calves enjoy the creature comforts in a new calf barn at Mighty Grand Dairy LLC, owned by cousins Myron Daniels, Dave Daniels and Gene Weis. Finished in December 2015, the new calf barn houses three 16-foot x 56-foot pens and a single-duct, positive-pressure ventilation system developed by Dr. Ryan Leiterman, a veterinarian and director of technical services at Crystal Creek Veterinary Service in Spooner, Wisconsin. The Flip Duct single-duct system for year-round ventilation was introduced to the market this past fall. At Mighty Grand Dairy, two vinyl ducts run parallel to each other the length of the calf barn. On one end of the barn are three 16-inch variable-speed fans that draw fresh air into the ducts. At the opposite end of the barn are two 20-inch two-speed exhaust fans. The fans are located about 4 feet off the floor and are covered with plywood boxes to draw stale dirty air off the lower 3 feet to 4 feet of the barn where calves breathe, Leiterman said. Inside the duct is an internal liner that separates a hole pattern for cold weather from a hole pattern for warm weather. The patterns vary depending on the number of calves in the barn, the barn’s dimensions and the height above the floor at which the duct is installed, Leiterman said. In winter, the side with small holes faces downward to deliver slow non-drafty air to calves. “When temperatures consistently hit 60 degrees, we’ll be able to rotate the tube”, Myron Daniels said. The opposite side of the duct has larger holes for faster air speeds. These faster speeds help keep calves cooler and bedding dryer in warmer months. More air movement also reduces stress caused by flies, Leiterman said. “We’ve been very happy with the system,” Myron Daniels said. He said Leiterman customized a ventilation plan for Mighty Grand Dairy and provided instructions on how to install it. Myron Daniels manages the calving operation, while Weis manages the heifer breeding program. Weis also co-manages the cropping operation with Myron Daniels’ son, Chad. Chad Daniels also is responsible for maintaining the farm’s equipment. 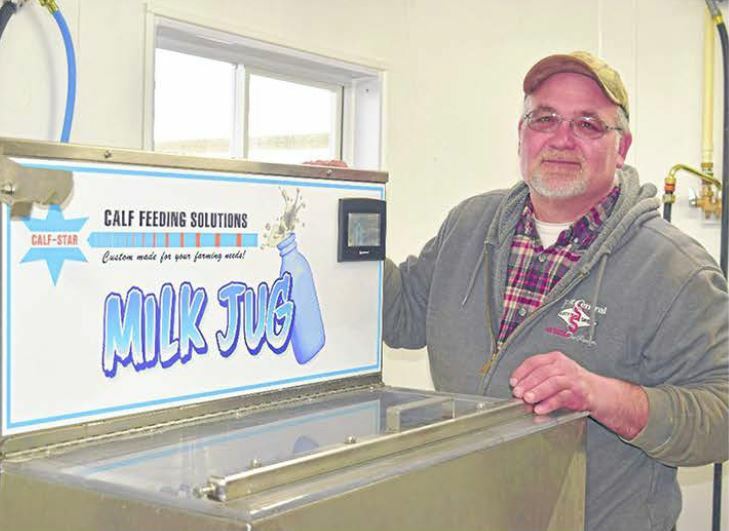 Dave Daniels manages the 500-cow milking operation and the farm’s financials. The LLC farms about 1,200 acres, which includes land they own as well as rent within a 6-mile radius of the milking operation. Mighty Grand Dairy currently produces about 550 acres of corn, 390 acres of alfalfa, 80 acres of wheat, 50 acres of soybeans and about 90 acres of winter rye. The corn and alfalfa is fed on-farm, while soybeans are marketed and wheat is grown primarily for straw used for bedding. The operation uses variable-rate technology for spraying and hay binding, and will soon use variable-rate seeding technology, Chad Daniels said. In addition to the calf barn’s new ventilation system, the farm partners decided to invest in an automatic feeding system. After their DeLaval dealer took Myron Daniels to visit several farms with automatic calf-feeding systems, they decided to purchase a DeLaval CF 1000+ with two feeding stations. The feeders connect to DeLaval’s ALPRO herd-management system, which enables Daniels to program ration and feeding plans. He can view information on a hand-held terminal, and will soon be able to access data on a mobile phone as well. The system’s software program records how fast calves eat as well as how much they’ve eaten. For the first two weeks, calves are fed 2 quarts of pasteurized milk at each feeding. The system is programmed to provide them two feedings daily for a total of 4 quarts per day. After 14 days to day 36, the amount of milk calves have access to increases to up to 10.5 quarts per day. “I’ve been feeding pasteurized milk for several years,” Myron Daniels said. Before making the switch to pasteurized milk in 2007, he was seeing problems with clostridium and Escherichia coli-E. coli. In just a short time after feeding pasteurized milk, he said he saw improvements in overall calf health and appearance. A pasteurizer and a cooler that can hold up to 100 gallons of milk are housed in the same room with the DeLaval feeding system. The combination system allows the use of pasteurized milk or a starter ration. “Once you get past the learning curve, automatic systems work well,” he said. He learned that the farm’s hard water required a different detergent than what other feeding systems generally need for thorough cleaning. The system’s suction hoses and valves are cleaned daily, while its heat exchanger has an automatic internal cleaning system. The automatic feeding system-as well as an automatic watering system-enables the family to focus more time on overall management of the calf operation versus hand feeding and watering. After weaning, calves are transported to Myron Daniels’ farm, where they are raised to 14 months of age. He currently has 270 calves on his farm. From there, they are transported to the Weis farm where they will be bred. And just before they are ready to calve, they are returned to the base farm, where they will join the milking herd. The creature comforts the calves enjoy during their first days of life help establish a firm foundation for their adult lives, as well as for future offspring, the family says. Mighty Grand Dairy makes for a mighty grand home.